Former Public Enemy frontman and political activist Chuck D spoke to students Monday night in the first of a series of events to highlight the situation in Darfur, Sudan. Chuck D jumped from topics ranging not only from the situation in Darfur, but also politics, race issues, media culture, and the state of modern hip-hop. 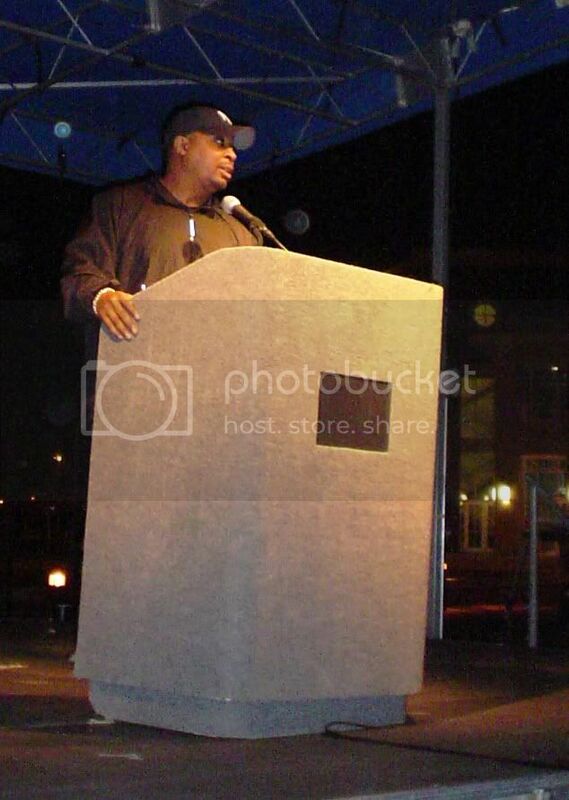 A staunch political activist Chuck D has spoke at more than 600 college campuses over the past decade. A man of many words Chuck D, aka Carlton Douglas Ridenhour, took the stage for close to two hours in a very frank discussion on issues that are affecting our world. Close to 200+ students came out to the event, many of whom are also camping out on a lawn at UCF to represent the many refugees being killed in Darfur. Chuck D closed the event with a photo session with profits going to support future efforts by Project Darfur. For more information on the situation in Sudan, go to Project Darfur.org (national site) or Project Darfur.com (UCF site). Go to Public Enemy to keep up with Chuck D and the boys. Well now it would seem that the Democrats are considering Orlando for THEIR National Convention in 2008. Many of the same cities that were asked for a bid for the Republicans were also invited to bid for the Democrats. Hmmm… wonder what would happen if the same city was chosen for both! Just kidding. But all kidding aside, I would love to see either Convention come to town. I think it would be a great boost for good ole O-Town!! Pervasive Artist Gary Baseman in Orlando. Cartoonist, gallery artist, and illustrator Gary Baseman will be speaking tonight at Rollins College in the Bush Auditorium. Well known for his animated series Teacher’s Pet Baseman will once again address the topic of ‘Pervasive Art’ and the emergence of art combining with toys. My intention with this post was going to be to actually post pictures and details from the event but I can’t go because another event needs my attention (I’ll post about that later.) So, I figured I’d let you interested parties out there know about it in case you didn’t already read the Orlando Weekly bit on the event. Baseman is doing a meet and greet from 3-4 p.m., and then the lecture starts at 7 p.m. The event is free and open to the public. I contacted Abbey Hertz, the orgaziner of the event, and she urged those interested to get there early because there has been a lot of inquiries into the event. Attendees also have the chance to win some of Baseman’s original art. Tomorrow night at Uberbot in Winter Park Village Baseman is doing a product signing and showcasing his new book Dumb Luck. 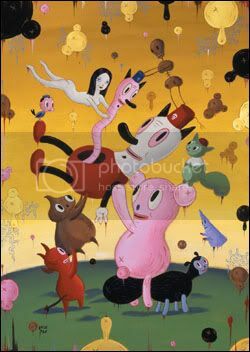 Posted in Uncategorized | Comments Off on Pervasive Artist Gary Baseman in Orlando. Orlando Shows Its Gusto Against Nazis. They came, they heil’ed, and then they high-tailed it out of there. Members of the National Socialist Movement conducted a march and rally that ended in front of the federal courthouse in Downtown. Too bad for them they were outnumbered by about 10-to-1 by those in opposition to their little pow wow. Various groups such as UCF’s Campus Peace Action, Operation Be Cool, Project Darfur, and a few others. “I’ve got more people than that in my own club,” said Matt De Vlieger, chair of the Progressive Council at UCF. The turnout of the Nazis was a little disappointing I thought. I was hoping that there would be more but this just goes to show that this anitquated way of thinking isn’t very popular here in Orlando. I wonder if they would consider this some sort of victory or a horrible failure? The small contingent of Nazis, who had a legal permit to march and hold a rally, ended things early. They had a permit that allowed them to stay from 2 p.m. to 4 p.m. but they hardly made it past 3 p.m. So much for standing for your ideals. The group marched to their cars escorted by a large police presence and left under the scornful gaze of following protestors. The worst thing about this rally is how much police time and effort had to be devoted to it. When our police officers could have been better serving the community they had to waste their time with this nonsense. Police arrested 17 people, most of them were from the protest side. From what I heard a large group of them were anarchists, but I’m not sure why police arrested them. One small fight occured toward the front of the protest crowd and a man was arrested but I don’t know how it happened. I almost didn’t make it in because I had a bag with me. Luckily I saw someone I knew and I stowed it in their nearby car. Police didn’t let any bags, sticks, bottles, umbrellas, or anything that could cause harm near the rally. It was suprising that so many people came out to protest such a small group. I think it shows that racism and ignorance have no place in Orlando. Perhaps our community is not as apathetic as we think it is. You can see a Flickr photoset here. 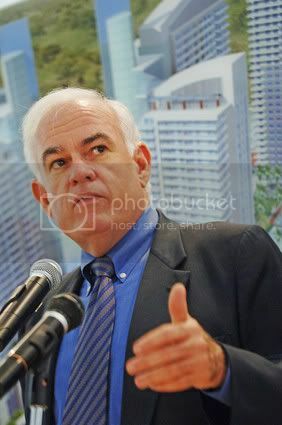 Orange County Mayor Rich Crotty made $112,000 in a private land venture with a major Central Florida real-estate broker whose projects regularly appear before the county government for approval. On Sept. 24, 2002, Crotty invested $100,000 in a Palm Beach County land partnership with broker Daryl Carter and more than doubled his money in one year. Two weeks before he invested the money, Crotty voted to approve a rezoning of more than 1,300 acres of Carter’s land in west Orange County, clearing the way for a $20 million sale of the property. And on Oct. 8, 2002 — two weeks after writing the check — Crotty voted to approve a development agreement for the project on the commission’s consent agenda. State conflict-of-interest laws prohibit public officials from knowingly casting votes that benefit a business associate, and require them to publicly disclose any conflict. Crotty did not disclose his relationship with Carter at the time of either vote. He said he was unaware that Carter was involved in the west Orange property until it was brought to his attention this week by the Orlando Sentinel, even though Carter’s name appeared on county development plans and on the County Commission agenda. After researching the matter in detail this week, Crotty concluded that he had not violated the law in 2002 — even unwittingly. He said he and Carter were not partners at the time of the first vote, and that Carter had sold the west Orange property by the Oct. 8 vote. Despite Mayor Crotty’s insistence that no wrong doing took place on his part something still seems fishy about this story. Perhaps it is a natural distrust of political figures making money on a deal they could have possibly had influence over, but for some reason I think there is more to this than Crotty is letting on. He conveniently “forgot” which staff member he talked to about informing him of any conflicts of interest in the Carter deal. Could it possbily be because no such conversation took place? That remains to be seen. Then again, this could just be a coincidence. Mayors are allowed to supplement their income just like every other citizen. Kudos on the site design Sean and Jason, it’s great. Heck, we even got a Boing Boing hat tip. Sweet! Student Platform Has Wider Appeal. It’s SGA President time over at UCF, and one candidate’s platform includes a proposal that has city-wide appeal. SGA candidates MaTT De Vlieger and Eric Eingold want to switch the student shuttle buses that traffic students around the University/Alafaya area to running on biodeisel fuel. Biodiesel is more efficient, cleaner, abundant, and cheaper in the long run. Why does this have city-wide appeal. If it is cost efficient to switch to biodiesel in campus buses, why not convert our entire Lynx fleet into clean-burning biodiesel buses. Lynx recently ordered 35 new buses with features that have nothing to do with a cleaner environment or increased efficiency. If they can afford to spend so much on aesthetic features, why not spend some money on something that would make Orlando a cleaner and environmentally friendly city? Lynx has stated that they will add some hybrid-biodiesel buses to their fleet but it may take as long as five years. Why will it take this long? An email from the Alternative Fuel Task Group was recently sent to Secretary of the Florida Department of Environmental Protection Colleen M. Castille. Hopefully it will have some impact on her when she shapes Florida’s future environmental policies. De Vlieger and Eingold recently brough a biodiesel bus from New Flyer for a campus visit. Jackson Goss, an engineering student, also joined the party with his biodiesel converted 1986 Mercedes sedan. Goss gets about 35 mpg on 100 percent waste vegetable oil. Not bad. We should all consider a future of cleaner fuels such as biodiesel, after all, we are addicted to oil. Oh and if you’re a UCF student, vote today! This weekend was the second big weekend of the Mardi Gras celebrations at Universal Studios and my roommate and I decided to head over to check out the festivities on Saturday night. We both have annual passes via the park’s “flex-pay” program [a really great payment plan for those who prefer not to shell out the full price of a pass at once]. We got inside the park around 7:30pm, with plenty of time to find a good place to stand along the parade route. We opted to park ourselves on the sidewalk near the musical stage, between the Jimmy Neutron and Twister attractions. This area is along the final pathway of the Mardi Gras parade, and is a good open spot to take photos. Well, you’re going to want to clear next weekend’s schedule to make time to attend MegaCon, a three -day sci-fi/fantasy/anime/comic convention being held at Orlando’s Orange County Convention Center. This event combines the best of a “fan” convention with a slew of opportunities to add to whatever fandom you collect on. Among the celebrities scheduled to appear at this year’s event are John Schneider (recently departed from “Smallville”), Marina Sirtis (“Star Trek: The Next Generation”), Tracy Scoggins (“Babylon 5”), Julie Benz (“Buffy the Vampire Slayer”/”Angel”), Clare Kramer (“Buffy the Vampire Slayer”), Steve Bacic (“Andromeda”/”X-Files”/”Stargate SG-1”), Tony Amendola (“Angel”/”Stargate SG-1”), Mark Lutz (“Angel”/”Mutant X”) and Jason Carter (“Babylon 5″/”Angel”). The convention is also offering appearances by many comic book artists, including George Perez (JLA Avengers, Wonderwoman), Tommy Castillo (Batman, Evil Ernie), Mark Brooks (New X-Men), Mike Perkins (Captain America, Spellbinder), Brandon Peterson (Ultimate X-Men) and Brian Pulido (Lady Death). I think I’m most looking forward to the Joss Whedon programming track, which will run throughout the convention. If you’re a fan of “Buffy”/”Angel”/”Firefly” or just of Whedon’s sense of humor, there will be episode screenings, gaming, actor panels and even a Whedon-‘verse-inspired costume contest. I think I’m most looking forward to the screening of the “Buffy” musical episode, “Once More With Feeling,” that will encourage an audience singalong. MegaCon runs Friday, Feb 24, from 1pm -7pm; Saturday, Feb 25, from 10am-6pm; and Sunday, Feb 26, from 10am-5pm. Some of the programming tracks will run past main floor times, up until 11:30pm. A single day pass is $20.24 (w/tax) in advance or $45.80 (w/tax) for a three-day weekend pass. Prices will rise slightly if you wait to purchase the tickets at the event. MegaCon organizers are also sponsoring a special event — “MegaCon’s MegaNight” — on Feb 23 at Universal’s Islands of Adventure. From 6pm-11pm, guests can ride the rides with some of the event’s celebrity guests, and from 9pm-11pm will enjoy exclusive access to the Marvel Super Hero Island. Tickets are $29.95 (plus tax) in advance or $5 more day of, and this is in addition to any other passes you may purchase for MegaCon itself. Make a Local a Design Star. We’ve all marvelled at the explosion in popularity of home design and interior decorating shows. It seems like every time you turn on the TV there is a new one on. Well, HGTV has a new one about to premiere but are choosing candidates in a unique fashion. Hopeful designers sent in audition tapes to HGTV’s Design Star contest and out of the 1,500 applications ten finalists have been chosen. These ten finalists will be voted on online between Feb. 20 – Feb. 26. The winner will compete on the eight-episode show premiering July 23rd. One of these finalists is Orlando local Dervon Hampton, a former professional entertainer who shifted gears into interior design just five short years ago. I met Dervon briefly at Barnes & Noble the other day and he was very excited at how far he has come. He would very much like to have his own show because well, who wouldn’t? So he asks for your help Orlando. All next week you can vote for one of the finalists and if you are so inclined give Dervon your vote. You can vote once everyday so hit it up if you’ve got a few moments. Help a fellow Orlandoan become a Design Star.